Bob Sawyer relates the history of Rubery Drama Group, marking its diamond anniversary. In 1951–52 the Rubery Congregational Church in Whetty Lane had a flourishing Youth Club comprising boys and girls in their early teens, most of whom had attended the church Sunday School. The club had the usual social amenities such as table tennis and snooker along with outdoor activities such as football, cricket and rounders. There was even a boxing tournament for the boys to run off their aggressive energy. The girls, however, had other ideas and the asked the club leaders if they could perform a play. They were fortunate at this time in that one of the leaders was a certain Mr David Banyard who, as well as being a church deacon and manager of Owens garage in Rubery, had some experience of amateur drama. With the help of the girls he chose a play and assembled a cast from within the club and the church congregation. The play was called Meet The Family by John J Melluish. It was about a well-to-do retired army major’s family who had a butler and a footman who were both shady characters intent on stealing the family silver. After much mayhem and not a few laughs the pair are brought to book and arrested by the local constabulary. This was to be performed in the church hall, a substantial wooden structure, on Thursday and Friday April 3 and 4, 1952. Thus, with the blessing of the church and minister at the time, the Rev Glanmor Jenkins, was born what was originally known as The Rubery Congregational Church Amateur Dramatic Society. Inevitably over the years the membership of the group has changed until now only a few members of the group are church members, but the now-named Rubery Drama Group are still based at what is now The Beacon Church Centre in Whetty Lane, with the blessing and support of the now United Reformed Church. The old hall was unfortunately destroyed by fire in 1959 but, largely by the efforts and enthusiasm of the then minister Rev Bert Jordan, a new and substantial brick-built hall was completed by 1961. In the interim period the group rehearsed in an upstairs room at the top of New Road, Rubery – affectionately known as Smoky Joe’s – and in a workman’s temporary hut somewhere near St Chad’s Church. 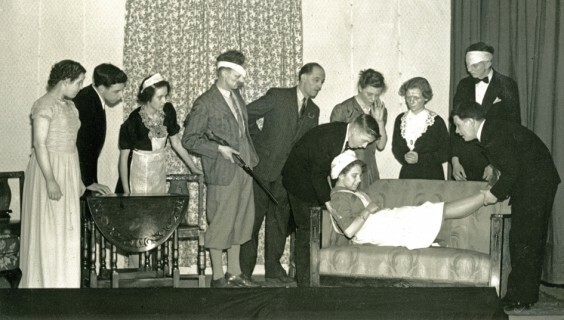 Plays were performed in St Chad’s church hall and in a hall on the Rubery Hill Hospital grounds. Over the years, the group has had its highs and lows. The membership has been as many as 25+ and as low as seven. Some members met their wives or husbands through the group, and many long lasting friendships have been formed. Sadly, some ex-members have passed on to that great theatre in the sky and are fondly remembered. On the other hand, two of our members were there at the very beginning and are still going strong today! In April this year the group performed Pools Paradise, a farce by Philip King, which was their 116th production. This play was last performed by the group in 1965 and four members of that cast are still active in the group. Rubery Drama Group’s portfolio includes plays by a wide selection of past and contemporary playwrights including Shakespeare, Ibsen, Arthur Miller, Noel Coward, Alan Ayckbourn, Ronald Harwood, Michael Palin, David Tristram and Alan Bennett. One of the group’s high points was the 1983 production of The Dresser by Ronald Harwood, directed by long-standing member David Morris. This had very favourable reviews and two of the actors were nominated for and received Evening Mail Entertainer Awards for “achievement that added to the standing of amateur theatre in the Midlands”. In 1952, some of our younger members were being made up to play older parts. Now some of the older members are attempting to look good in the younger roles! Many thanks to those who have been our loyal supporters over the years - please keep coming. Above: Meet The Family cast members: (standing) Joy Young, Mike Birch, Miriam Hobbis, George Stretch, Norman Higgins, Janet Holland, Doris Parkinson, Jim Bate; (in front) Bob Sawyer, Valerie Gardener, David Banyard.